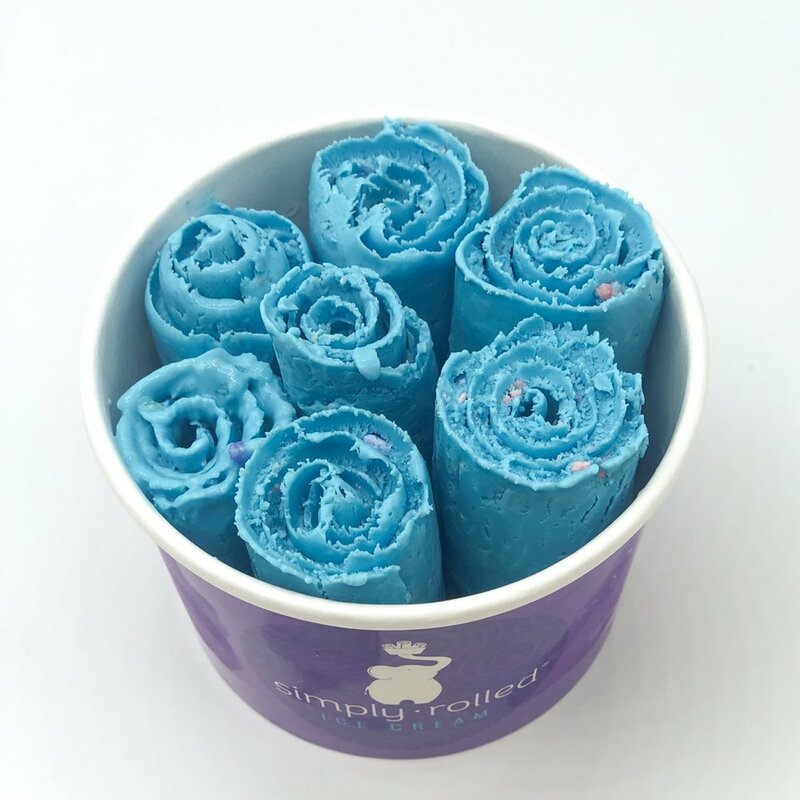 Simply Rolled Ice Cream got its inspiration from the street vendors of Thailand. 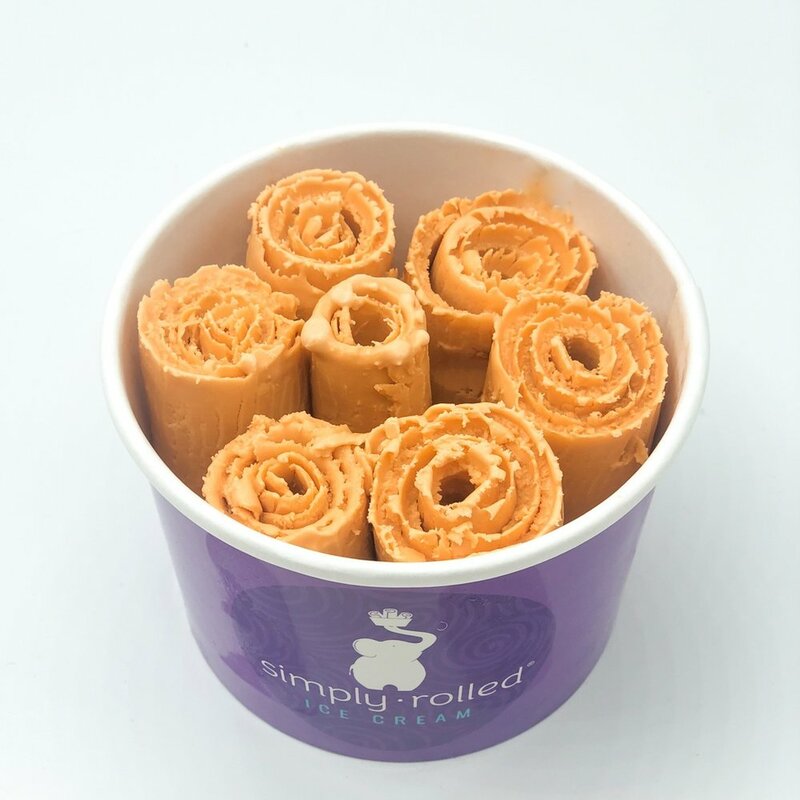 We offer made-to-order ice cream rolls, which is both fun to watch and delicious to eat. Our ice cream is the freshest you can get. 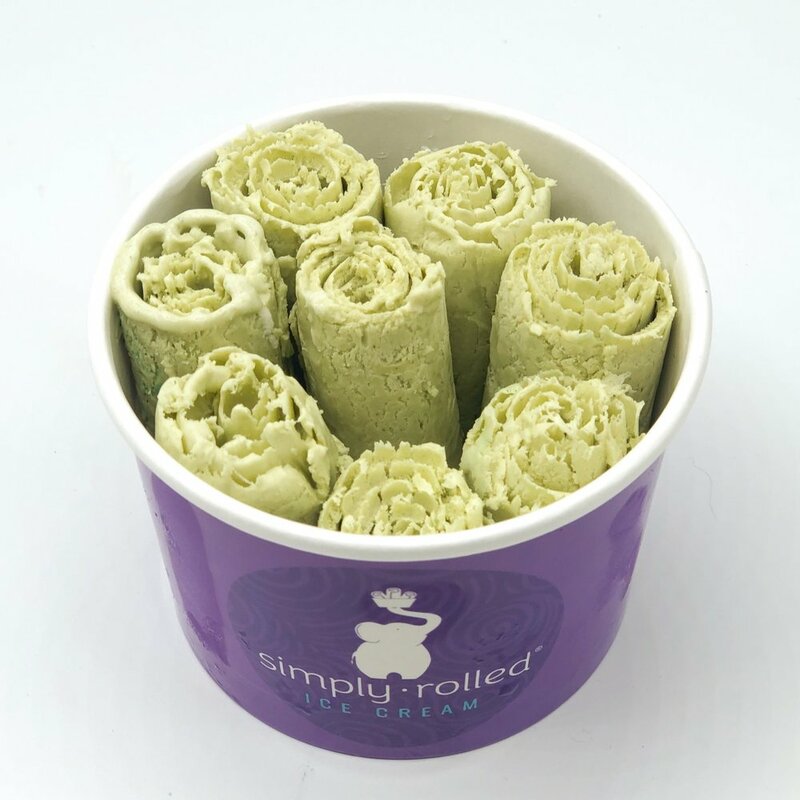 It has never been frozen until it transforms from a liquid to beautiful ice cream rolls right before your eyes! We use our own custom base recipes; never a pre-made, mass-distributed powder. Our recipes consist of ingredients that are sourced locally whenever possible. Our matcha green tea base contains pure organic matcha of Japanese origin. 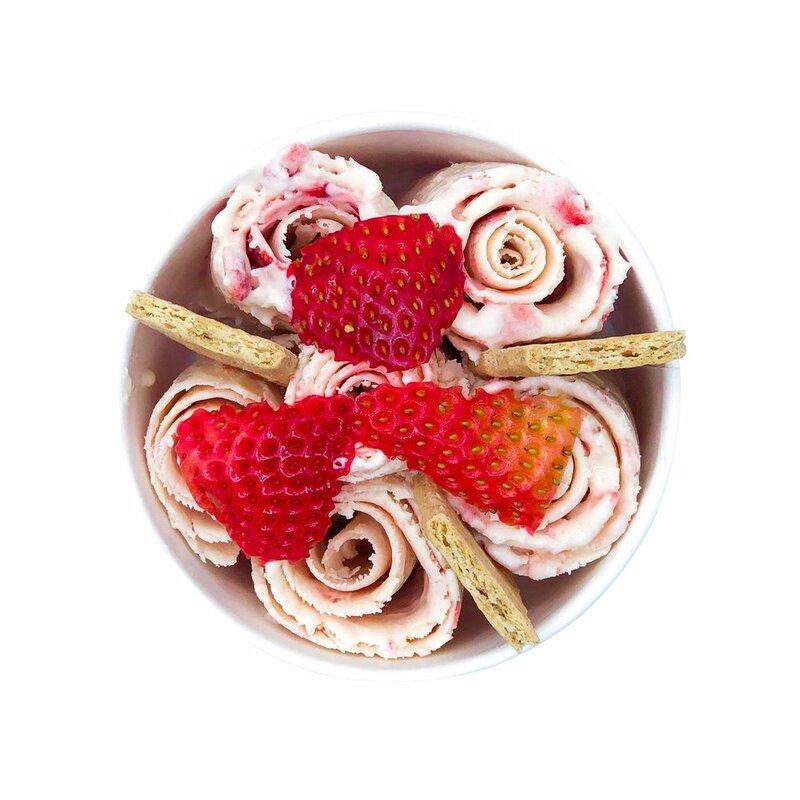 Looking for vegan ice-cream that actually tastes like ice-cream? Our vegan vanilla base was created with creaminess & flavor in mind! It is made in-house, using the perfect balance of organic cashew milk and coconut cream. Choose your favorite ice cream base and turn it into a custom masterpiece as you choose from over 20 mix-ins and toppings to suit your taste. 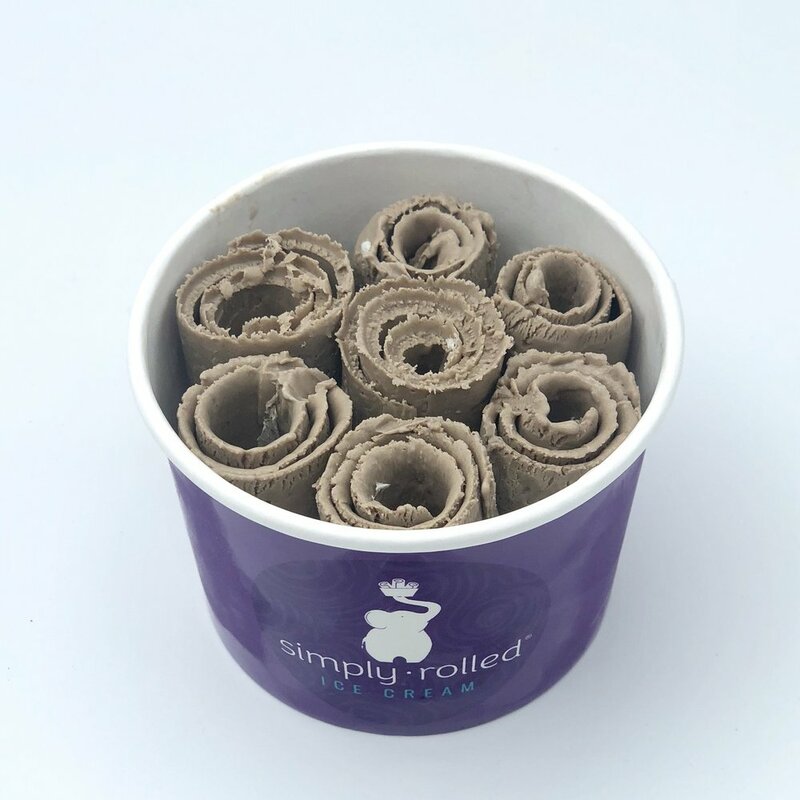 Come experience Simply Rolled for yourself! Our ice cream is made fresh and rolled-to-order. Try one of our signature rolls or create your own masterpiece. All rolls are topped with artistry using your choice of unlimited toppings. A caffeinated treat for all the frappuccino lovers out there, this rolled ice cream features coffee, chocolate chips, & hot fudge. 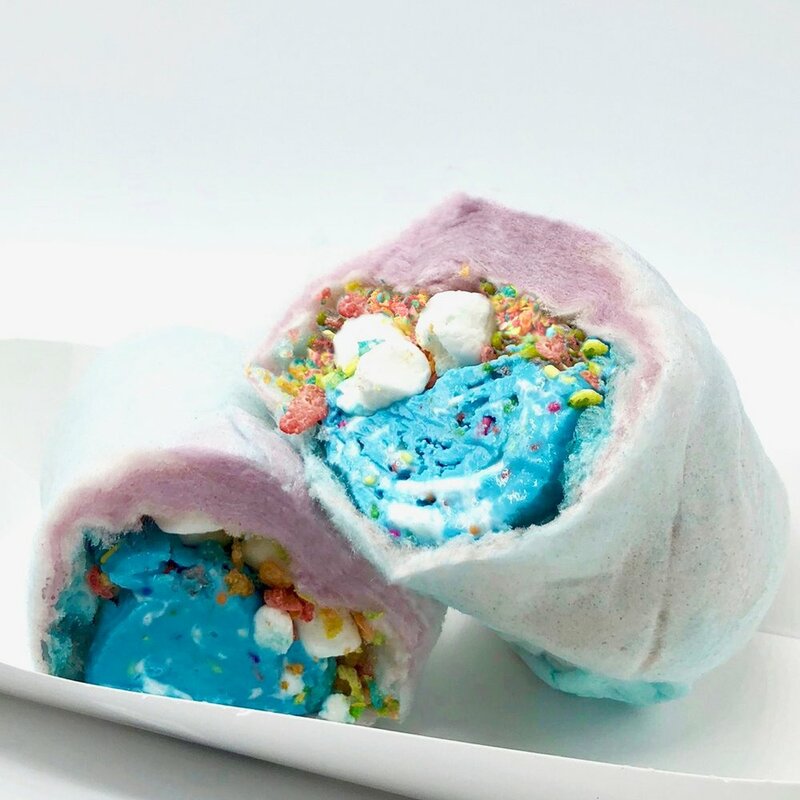 Cotton candy ice-cream with sprinkles, marshmallow sauce, fruity pebbles, & more marshmallows, all rolled into a burrito made of cotton candy! The Easter Roll is back!!! 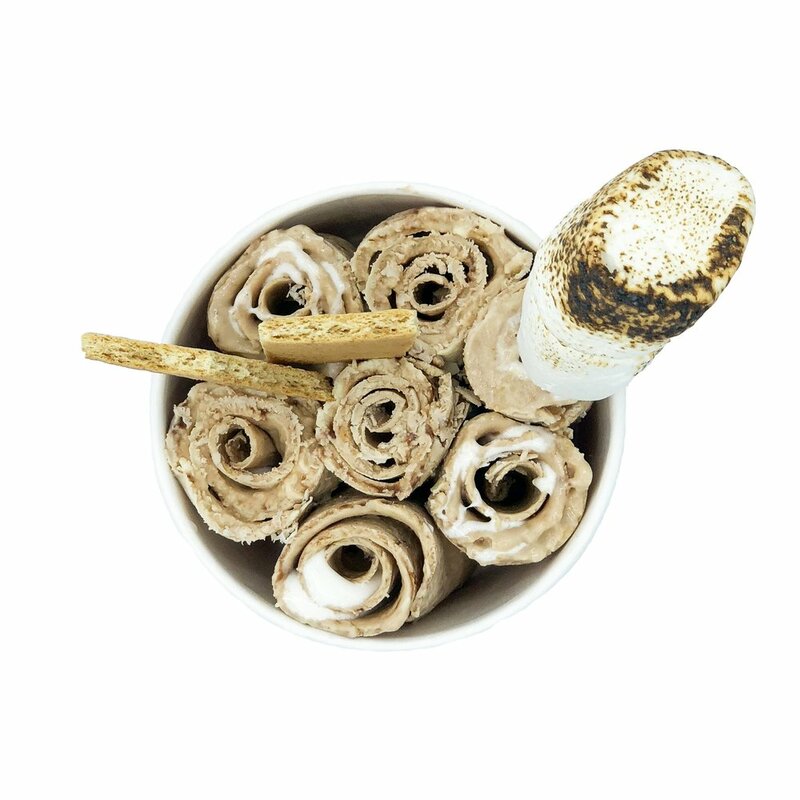 Come watch as a whole Cadbury Egg is chopped up and made into ice-cream rolls, topped with a toasted marshmallow Peep. Chocolatey base + marshmallow sauce + graham cracker + a toasted marshmallow! Our original vanilla base, made fresh and sourced locally, is the creamiest ice-cream around! Our custom blend of sweet cream and Thai ice-tea. Be a kid again with our delicious cotton candy base, specially made in-house. Our matcha green tea base is made using 100% organic Japanese matcha. If you love brownies, you’ll love this new chocolatey base! Made fresh, in-house, using the perfect balance of organic cashew milk and coconut cream. All the health benefits of raw activated charcoal come together with the right balance of sweet coconut cream. It doesn’t have to be your birthday to enjoy this hand-crafted treat! Our new vegan base is a blend of pure cocoa, cashew, & coconut cream, and is quickly becoming a staff favorite! *Some products may contain egg, nuts &/or gluten. Unfortunately, we are not a large enough facility to have allergen free areas. All products are made on equipment that comes in contact with wheat, nut, & dairy products. We offer catering services as well as in-store fundraisers. For more information & to check availability please complete the request form that pertains to you and we’ll be in touch soon! Our ice-cream machines need to be plugged in. Please ensure that at least 12 amps of electric is available for our use. Fundraisers are scheduled Monday-Thursday only. Is there any other information you'd like us to know about your organization? Give the gift of ice-cream! Gift cards are available for purchase in-store at all locations OR if you’re short on time, purchase a digital gift card that can be emailed to anyone, anytime, by clicking one of the location links below! Click below to provide your general information and someone will follow up with you if we'd like to move forward with an interview. If you'd prefer to send your resumé, please email jobs@simplyrolledicecream.com. How many hours/week are you looking for? We've received your message and are reviewing your application. Someone will be in touch with you if we feel you align with our current employment needs. Thank you!